LAKELAND – You've heard that the best churches have left the building. Now Florida Conference ministries have a chance to follow suit, shedding the walls and tables of traditional display booths at Annual Conference for a more welcoming approach reminiscent of a cozy family room at home. As part of this year's Ministry Expo at Annual Conference, nearly half of The Lakeland Center's Exhibit Hall will be devoted to The Gathering Area, where volunteers will be on hand to discuss and promote various ministries of the conference and the United Methodist denomination. Representatives of seminaries also will be there. 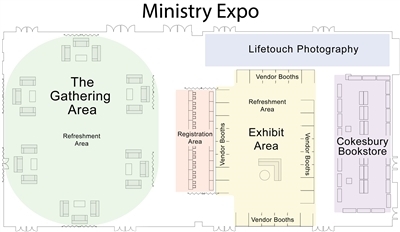 Visitors to Annual Conference 2013 will find a new look at Ministry Expo, with less of a booth-to-booth experience and more emphasis on relationship-building in The Gathering Area. Graphic depiction by Dave Walter. Guests will find refreshments and clusters of comfy furniture, along with laptop computers set up to check websites and send questions by email to conference departments if answers are not readily available. "Think of it as being in your living room," said Pam Garrison, who is organizing the expo with Greg Harford, both of the Florida Conference Disaster Recovery Ministry. Garrison said the idea was to bring the traditional exhibit hall experience more in line with the theme of building relationships and becoming disciples. "We wanted it to be less about walking from booth to booth," Garrison said. "It's really about starting a relationship. … The idea is for it to be fluid and welcoming." On the other side of the hall will be booths for commercial vendors, including Lifetouch Photography, the Cokesbury bookstore, the Florida United Methodist Foundation and the United Methodist Connectional Federal Credit Union. The conference registration table will be in the center of Ministry Expo on Wednesday, June 12, and at the opening of Annual Conference the following morning. It will move out of Ministry Expo to Guest Services Thursday afternoon, June 13. All pastors, lay and clergy, are encouraged to visit the Lifetouch display to have their picture taken for the Clergy Directory. District superintendents are particularly eager to see that this year because they find it helpful to put faces to names during the appointment process, said Rev. Charles Weaver, assistant to Bishop Ken Carter. The photographs will be taken for free by Lifetouch as a promotion and can be used in other settings, including the Florida Conference website, Weaver said. Volunteers are being recruited to circulate in The Gathering Area, welcome guests and talk about Florida Conference ministries. For information or to sign up, contact Garrison at pgarrison@flumc.org or Harford at gharford@flumc.org. Wednesday, June 12: 2 to 7 p.m.
Thursday, June 13: 8 a.m. to 6 p.m.
Friday, June 14: 8 a.m. to 5 p.m.
Also new for this year's Annual Conference are opportunities to volunteer to package food for Stop Hunger Now, part of the Florida Conference's "A Million Reasons" campaign. Volunteer shifts are available Wednesday afternoon, June 12, and the following morning. Click here for information or to sign up. In keeping with the event's theme, "Becoming Disciples of Jesus Christ," conference delegates also will be invited to participate in breakout sessions to discuss the discipleship experience. In addition, individual storytellers will be scattered throughout the agenda to share their journey to discipleship. For more information about Annual Conference 2013, click here. -- Susan Green is the editor of Florida Conference Connection.